Total Armageddon Lost Shelter - You take the on the role of one of the survivors of a world wide nuclear war, your community is growing and they need supplies. They ask you to take care of business, so you need to explore the unknown lands around your safe shelter. Total Armageddon: Lost shelter is a action packed 3D third person shooter with elements of a simulation game. The combination between these two game features make the game unique on the google play store. 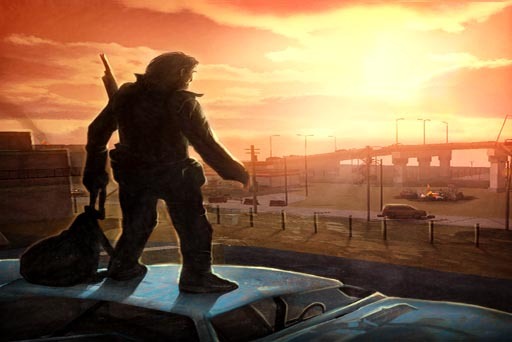 As you salvage supplies in a full 3D free roaming environment, you can encounter gangs of people you can explore different area’s and make sure you survive the hard world during the aftermath of a world wide nuclear war. These epic gameplay elements make Total Armageddon Lost Shelter unique in its kind! After the great nations went head in head in a global nuclear war, where armies were destroyed and countries lay in ruins and state of destruction. Years later the survivors the once that saw things coming the doomsday preppers, want to rebuild after the last war that destroyed the world. Waiting in post apocalyptic shelters they are soon going to realize the world has changed a lot, and that the lucky ones died in the blast. Crazy tribes now rule the lands after the fallout of the blast cleared away. You need to find the supplies for your people so you and them can rebuild a thriving community. So it's not only a post apocalyptic 3D third person shooter but also a 3D simulation game. - Action passed 3D third person shooter elements. - Rebuild your thriving community, make sure you find the supplies they need. - Loads of different missions set in different area’s. - Find epic weapons, add them to your gun inventory and blast your way through the wastelands of this nuclear war post apocalyptic 3D adventure game. - Leveling system for your buildings and character. BLAST YOUR WAY THROUGH HORDES OF ENEMIES IN THIS EPIC LOOKING POST APOCALYPTIC SIMULATION GAME! As you search the different locations you will encounter different people on the way, trying to stop you from taking what is yours. The on screen controls are easy to use, but still this post apocalyptic 3D third person shooter offers more than enough challenging moments. Have fun as you spent hours looking for supplies and fight your way through the levels. To be up to date about all the improvements and new gameplay content we offer for, please follow us on the following social media channels. Total Armageddon Lost Shelter: install APK and play the game!